Flexcool, utmost flexibility of application and efficiency of operation from Aquatech, Piovan Group. 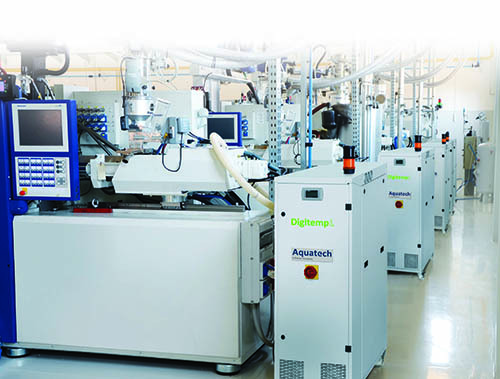 Aquatech, one of the recently established companies of the Piovan Group, with core competences in industrial cooling systems, makes its debut in the market with an engineering solution that supersedes the principles of centralised systems, to ensure greater energy efficiency and savings of between 35 and 50%. The Flexcool solution, in fact, can use ambient temperature to cool the processing equipment. Such a peculiar strategic feature makes Flexcool ideally suitable to serve sets of injection moulding machines having diverse characteristic, that is, in work situations where different users are present and operating at varying processing conditions (temperature, flow, pressure). Flexcool ensures the highest level of control, flexibility and energy efficiency. The conventional design of a centralised cooling system suffers of substantial thermal energy losses. The chiller, for example, produces cooling water at one temperature, the lowest necessary, for all equipment, moulds, and hydraulic circuit of the machinery. No matter whether some of the injection moulding machines are of the latest generation or the moulds that equip those require a higher temperature or a lower flow, the cooling system will operate in the worst condition possible forever. Flexcool instead consists of a central dry cooler of the Aryacool line coupled to a series of thermochillers of the DigitempEvo line. One DigitempEvo each injection moulding machine. In this way, it is possible to achieve the optimum operating cooling temperature, water flow and pressure for each machine, depending now on production specifications and not anymore on equipment limitations. The first improvement, immediately appreciable, is the obtainment of an average electricity savings of 35%. Each DigitempEvo is equipped with a digital scroll compressor and an electronic expansion valve: these two components allow optimisation and stabilisation of the water temperature control and reduction of the energy required to cool it, without fluctuations or losses. The Flexcool solution can produce savings in excess of 50%, as under normal operating conditions most of the heat load is handled by the Aryacool drycooler, while the DigitempEvo refrigerant circuit is only activated for those moulds requiring a cooling temperature lower than that produced by the Aryacool unit. The heat load issue is crucial to understanding the technical reasons behind Flexcool. At a manufacturing site, the cooling system must be sized for the maximum heat load, which can only be achieved if all the machinery is in operation at the highest throughput, while the ambient temperature is the highest along the course of the entire year. This condition reflects a purely theoretical operating model. In reality, a cooling system will always work at partial loads, which is a critical condition by nature, as it imposes alternate cycles of start-up and shut-down, that make the system highly inefficient.This problem is completely eliminated by Flexcool, which optimizes cooling capacity distribution as a function of the individual mould characteristics. The digital compressor with which each DigitempEvo is equipped, modulates its capacity between 20 and 100%, depending on the thermal load. The flexibility of Flexcool is therefore particularly appreciated in the presence of partial and variable loads: a condition that systematically occurs. The main components of a Flexcool solutions are the Aryacool drycooler and the DigitempEvo thermochiller. Industrial cooling technologies evolve at a high pace, so to keep up with the demand of being more and more process centred and adaptive to increasingly variable production conditions. Flexcool was developed to cope with those stringent conditions of operation and to deliver the highest accuracy of control, flexibility of duty and efficiency of energy utilisation. Aquatech’s newly introduced range of thermochiller of the DigitempEvo series, along with the new line of Aryacool dry cooler units, are the main elements of the Flexcool solution and represent the state of the art in the design of modern cooling equipment and controls. Contact Piovan for more information.